I actually play bass but I love to do reggae-style, R&B, "Steve Cropper" riddim guitar. I own three Fender basses (a 66 Jazz, a 72 Tele which has been customized to resemble a 50's Precision bass, and a blue Mustang with a racing stripe). I eBayed an Aria copy of a Mosrite bass a few months back which is extremely nice and sounds good. I am partial to Ken Smith strings and it sounds even nicer now - it's a sort of utility bang-around bass and I have a set of Gotoh tuners which I've had since about 1985, and these will go on it. For some reason I enjoy buying, playing, and working on cheap guitars, not basses. I change pickups, change bridges, put tung oil on the fretboards, and once in a while do nothing. These aren't collector guitars, they're nicked and dinged, and I won't buy one unless it looks played. I was just exchanging email with someone who's also into these things. We were discussing how to get a good cheapo working. Usually I'll listen to the pickups, first and see if the neck is a mess or not. Slight fret wear doesn't bother me. If it sounds interesting, the next item is intonation. If the bridge is hosed I look about for a new bridge. Next tuners - it doesn't matter if the tuners are good if the guitar can't be intonated. If the tuners need replacing I usually go with the cheapest (eBay or Stew-Mac) decent replacements I can get. Usually this is where I stop with the major stuff. I have considered new nuts but at the moment have only replaced one. I am looking for a few more cheap guitars... I am in no hurry here, in fact, I'm not as busy fiddling with instruments as I was a few years back. I'd like to say there's a master plan in operation, but there ain't. Sometimes my list changes. I usually buy black guitars, it seems. I used to shop a lot at Daddy's Junky Music in Boston when I lived there, but now I live in Maryland. Mark, in the Cambridge store (Mass Ave, almost in Arlington), is a real hero as far as I'm concerned. Maryland is pretty quiet as far as guitar shopping as I'm on the Eastern Shore. Good for boating, sandbars, and farms, not so great for guitars. Keep scrolling down for pix. This photo swiped from the Web. a '61 Melody Maker: my first electric guitar but bought about 1975. Ibanez was Ibanez. Missing nameplate. made by Harmony, semi-hollow without f-holes, it's a Stratotone in a tux. A big favorite. this is Guild's Japanese budget brand. Another big favorite, seems identical to the Univox clone. it has a Strat pickup layout & trem, red, white binding, sort of an uncheap cheap guitar. ...in 1983, they didn't have strings-through-the-body because CBS owned Fender and they'd gone completely insane. So I got it cheap, but it doesn't sound cheap anymore. It now has a string-through bridge. ...in pieces at the moment), well, it was in pieces when I bought it for $40. ...black, Strat-shaped, way cool. Basically an Ibanez strat clone with basswood body. ...insane spatter paint job, missing parts, fun, two pickups and tremolo. ...it's an electric guitar, like a solid-body ES335, made by Mosrite for Acoustic, the '70s amp guys. an Excelsior to teach myself how to redo frets: cool shape, but a messed up neck. Another $40 wonder. I have obtained an old Hagstrom neck of the proper scale for it. Will I ever steam off the fretboard and plane down the old Excelsior neck? Stay tuned! 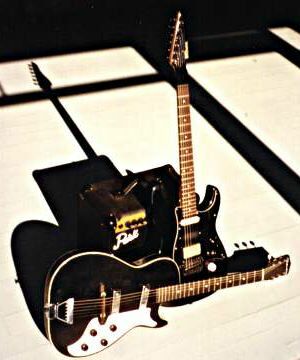 The Casio MIDI Guitar and the Silvertone with my Park practice amp. The Casio has an old Gibson pickup in the bridge position and a stacked single coil in the neck position. The stock pickups aren't bad but aren't anything special. The big while knob is the MIDI output volume setting. Here is El Excelsior, disassembled and ready for refretting. All the pieces came with this one. I love the artistic greenburst and black color scheme. The pickups sound good though the neck needs a fretboard planing and sanding and I may just buy a new neck for it. The very cool Excelsior Headstock®. In this day of Headstock Paranoia, it's nice to see a new shape that doesn't have lawyers™ attached to it. Click below for a printable full size pattern. Far Left: The "Les Paul Special" ready for a new bridge from Stew-Mac and a new set of tuners. One pot shaft is broken off and the tone pot soldered full-on. These ersatz soapbars sound great. The neck is bolt-on - actually so is the Black Widow's. Well, I finally found a Talbo Bass picture. This is identical to the one I had, from the Tokai web site. This here thing is a "Blazing Fire" Talbo guitar with an ash body, which is I what I played, I think, in Boston and then failed to buy when I should have. Normally the bodies are aluminum. I guess an aluminum one would be OK. I'll keep looking.